Replacing QuikBlade runners is an easy two step process that can be done anywhere, any time and with no tools whatsoever. It can be completed in seconds. While squeezing the trigger on the chassis, pull the heel of the QuikBlade runner out of the chassis, then unhook the front of the runner. Click on any of the images to view an enlarged version. Squeeze the trigger and pull the heel of the runner out of the chassis. Remember, the runners are sharp. Hook the runner toe into the front of the chassis and then click the rear into position. Remember, the runners are sharp. 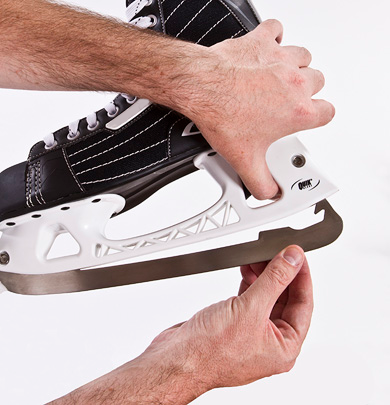 Insert a new QuikBlade runner by first hooking it into the front of the chassis, then push the heel of the runner into the chassis until you hear a “click”.